A powerful and inspiring examination of the connection between the potential for great talent and conditions commonly thought to be “disabilities,” revealing how the source of our struggles can be the origin of our greatest strengths. 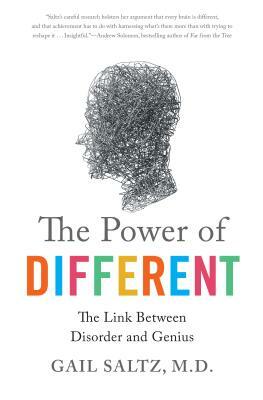 In The Power of Different, psychiatrist and bestselling author Gail Saltz examines the latest scientific discoveries, profiles famous geniuses who have been diagnosed with all manner of brain “problems”—including learning disabilities, ADD, anxiety, Depression, Bipolar disorder, schizophrenia, and Autism—and tells the stories of lay individuals to demonstrate how specific deficits in certain areas of the brain are directly associated with the potential for great talent. Saltz shows how the very conditions that cause people to experience difficulty at school, in social situations, at home, or at work, are inextricably bound to creative, disciplinary, artistic, empathetic, and cognitive abilities. Enlightening and inspiring, The Power of Different proves that the unique wiring of every brain can be a source of strength and productivity, and contributes to the richness of our world. A Clinical Associate Professor of Psychiatry at The New York Presbyterian Hospital/ Weill-Cornell School of Medicine, Dr. Gail Saltz is a psychiatrist, columnist, bestselling author, television commentator, and magazine contributor. She has been featured in print and on television in places like The Oprah Winfrey Show, Dateline, Fox News,Anderson Cooper, Today Show, Good Morning America, Parade, Redbook, Women’s Day, the New York Times, and others. She is the host of "The Power of Different" podcast and she lives in New York with her family.